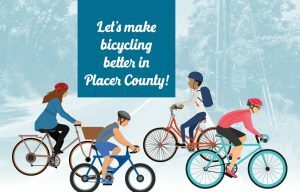 Let’s make bicycling better in Placer County! Invest a few minutes and share your thoughts on ways to improve the cycling experience for everyone. PCTPA and Placer County are hosting a “Virtual Community Workshop” until Thursday, June 22. Join the discussion at www.pctpa.net/bikewayplan. Your input will help update the Placer County Regional Bikeway Plan. Let other cyclists, family members, and friends know and encourage them to participate! ← Tired of sitting in Highway 65 traffic?